Four luxury 4 star self-catering mews houses are located in converted stone cut farm buildings in a picturesque court yard. Old world Victorian charm has been combined with modern day luxury. 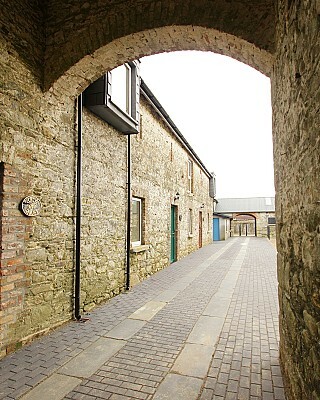 The entrance to the Court Yard is through an old arch way onto the original flag stone track ways used by horses and carts in years gone by. One of the mews houses has 3 bedrooms and the other 3 each have 2 bedrooms. All the houses have a spacious open plan dining/living room area with a Waterford Stanley wood burning stove. The mews houses are furnished to an extremely high standard with the comfort of visitors of foremost importance. All beds have high quality orthopaedic mattresses and luxury Egyptian cotton bed linen to ensure that guests have a good night’s sleep. Windows are double glazed to ensure warm houses. All the houses have 2 bathrooms with a power shower and bath/power shower. Complementary Wi Fi, satellite TV stations and a selection of reading material is provided for guests. There is a large enclosed patio area to the rear of each house with garden furniture. Guests can also enjoy barbeques in the main garden in the Court Yard which features an old stone well in the centre. A games room with a pool table, darts and ring boards can be enjoyed by all ages. Miles of stunning walks through the ancient woodlands and alongside the river are not to be missed. Visitors can also bring their horse on holidays with them and enjoy the cross country course and bridle paths through the estate. Fishing and shooting is also available to visitors.